A list is something I have never been good at until this past year. I found out that making lists works for my kind of brain. I get overwhelmed fast when there is too much to do and I tend to shut down. There is something really satisfying about crossing off a task, a goal, or a grocery list. My brain is firing at 5,000 thoughts per minute and I was finding it hard to focus or even remember what the heck I needed to do each day. I found that leaving a notebook and a pen by my bed was helpful for those nights you wake up with all kinds of ideas or remembrances of things you've forgotten to do that day. That's when the list becomes a sleep aid...once I write it down, it's somehow released from my brain and I'm able to go back to sleep. Try it. It's better than sleeping pills. 3. Cross each task off as you complete it. Will you finish everything on your list every day? Probably not. Most days you will not complete your list. That's OK, there's always tomorrow, and the next day. Baby steps. Don't sweat it. Start over tomorrow or adjust your list. For those blessed days I don't have to run all over then my list includes the things I want to accomplish in my home, yard or neighborhood. This includes visits to friends, cutting my parent's hair, walking the dog, exercise, etc. When you do cross completed tasks off of your list, cross them off with big, fat lines using a bright pen and then feel good about all you did! Want to try it? Here's your chance. 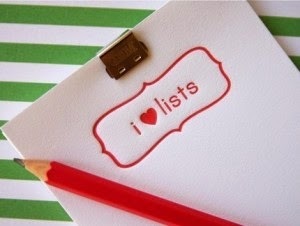 I'm giving away 3 lists with a sticky note and a cool pen. All from Target. I love Target. To win, leave a comment about the first thing you'll write down on your list and include your email address...can't wait to hear from you! I am a girl of a hundred lists, what shall I wear, who I have kissed!